If you ARE one of those who want to squawk though, I really do understand and won’t hold it against you. But once again I was confronted with an unenviable choice to make and I made it, even though I know it has the potential of causing confusion, chaos and could create a time paradox, the result of which could cause a chain reaction that would unravel the very fabric of the space-time continuum and destroy the entire universe. Granted, that’s a worst case scenario… not to mention cribbed from Doc Brown, whose musical tastes I’m quite certain ran more towards Luigi Russolo than early rock ‘n’ roll. Anyway, as much as I crave accuracy in such matters and as important as it is to not potentially spread misinformation, which happens far too often on the internet when it comes to musical “factoids” that are entirely made up and then passed along like cholera, all of that SHOULDN’T happen here if people just read the disclaimer (that would be this elongated intro you’re currently in the midst of falling asleep to in case you were wondering). As stated with Percy Mayfield’s first appearance here on Spontaneous Lunacy back in December, 1947, determining the accurate release dates of the otherwise inconsequential, barely keeping its head above water and soon to be defunct Gru-V-Tone records is an exercise in futility. We know they were cut sometime in late 1947 and since the record company was not long for this world they HAD to come out sometime in the next few months. So for Jack, You Ain’t Nowhere we chose December 1947 even though it might’ve been a little earlier… or a little later. Now we’re at it again, for the last time I assure you, only because Gru-V-Tone has no more records left in the vault to exhume, and while with “Jack” I was doubtful I nailed the month it came out by mere chance, with this one I KNOW I didn’t. That doesn’t mean I have any real idea of when it DID appear, but my best guess would be a few months back, meaning February or March. A company like that, without two nickels to rub together, wouldn’t hold back the only product they had for long and while normally a record label would let the first record by an artist have the floor to itself in the hopes it’d catch on, Gru-V-Tone was in no position to be so patient. Therefore they almost certainly threw it out on the market right away, maybe even at the same time as “Jack” in the hopes that it could stave off the inevitable and keep them in business until spring or summer. So I know that, and now you know that too, which brings us back to why I’m slotting this in May 1948 instead of about a three dozen reviews behind us in the rear view mirror. Well actually I’m not really sure why other than it has to go SOMEWHERE because it’s definitely a record worth examining by an important artist we’ll be covering at length down the road, and rather than take an equally random guess and insert it into the winter release rolls when there was a lot of stuff going on that was having a much greater impact on rock’s overall story that needed to be covered assiduously, now we’re in the midst of a bit of dry spot for a few months, when the best of the sides cut by every label back in the waning days of 1947 have already been issued and so it’s largely the second tier material we’re seeing. This gives us a way to break up the repetitiveness of the same names popping up again and again if nothing else. I’ll admit, that’s not a very GOOD reason, but it’s the only one I’ve got so I’m sticking with it and hoping that any excuse to talk about Percy Mayfield, even a still unknown Percy Mayfield, will be enough to overcome any objections to the random placement of his appearance. But just to make sure there are no illusions about it being slotted here I’ll reiterate: IGNORE THE RELEASE DATE! ANY RESEMBLENCE TO THE RECORD’S ACTUAL DATE OF ISSUE IS PURELY COINCIDENTAL AND TO BE HONEST, QUITE REMARKABLE. There, that clears my conscious, how about yours? All of this preamble for a record that is rather scratchy and distant sounding done by an artist who was two years away from making any impact whatsoever. Furthermore, this isn’t even the version of the song that most devoted Mayfield fans are aware of, as he re-cut this for Supreme Records around the corner with a much fuller arrangement (by Maxwell Davis no less) and with far better fidelity than the aural haze of this Gru-V-Tone release. But the original version of Two Years Of Torture still has a lot going for it, not least of which is the additional insight into Mayfield’s already fully formed sense of song craft which is highlighted here to great effect. Because there’s less window dressing surrounding it than is found on the more well-known version all of Mayfield’s unique attributes come to the forefront – his intelligence, his vocabulary, his way around a melody and sense of dramatic presentation, all things that will set him apart when he breaks into the big time around the corner. The rumor has long been that Mayfield wasn’t thinking of himself as an artist at this point, but rather a songwriter only and supposedly he’d taken this to Los Angeles with the hopes that Jimmy Witherspoon, a rising blues artist, would cut it. As legend has it upon hearing Percy run through the song at the piano it was decided that he should cut it himself. A good story maybe but stories like that have a tendency to be only vaguely true. The various renditions of this tale are as follows: Jimmy remembered it that he was involved in a royalty dispute with Supreme Records chief Al Patrick at the time (which would make it 1947 at least) and Witherspoon refused to record anything until he was paid what was owed him, thus Mayfield cut it himself. Not implausible except this version pre-dates Percy showing up at Supreme entirely, so Mayfield’s Gru-V-Tone take on it presented here was certainly cut with the intention that it be a release on Percy Mayfield himself. Now after that, as in a couple months, weeks, days, or even hours later for that matter, Mayfield might’ve wandered down the street to Supreme Records and offered it to Witherspoon to cut as well. That kind of thing DID happen more than you’d think back then when sessions were often not logged properly, musicians paid under the table and copyrights discarded like cigar bands and empty gin bottles. Since the rough recording date usually given for the version Mayfield cut for Supreme was also 1947, that means this scenario might be feasible. Except Mayfield’s Supreme Records version didn’t get issued until 1949 which is kind of strange, especially considering the effort that would’ve gone into the Maxwell Davis arrangement (for which he certainly must’ve been paid, no fresh off the turnip truck was Davis). Why sit on it that long, especially when Supreme would soon lose Witherspoon to Modern Records and weren’t exactly stocked with big name artists to keep the hits rolling in. Further confusing matters is Witherspoon’s recollection that the song he was offered by Mayfield wasn’t even Two Years Of Torture but rather Mayfield’s later 1950 breakthrough, the indelible Please Send Me Someone To Love, which was never recorded by Percy on Supreme, but rather on Specialty, three whole years after all of this took place, not to mention three full years after Witherspoon himself left Supreme! Now this certainly could be a case of selective memory, Jimmy Witherspoon was a singer after all, not a record historian, so since that later song became Mayfield’s signature hit he could merely have substituted that title for the real one offered without even being consciously aware of it. Or perhaps he WAS aware of it and somehow trying to suggest that HE would’ve gotten a hit too with “Send Me” had he cut it. The fact that he didn’t also could be taken to mean Witherspoon was claiming incidental credit for launching Mayfield’s own hit-making career. But clouding matters up even more is the fact there’s reportedly a Mayfield sung demo version of Two Years Of Torture in the Modern Records vault where Witherspoon WAS recording in 1949, but a label that Percy Mayfield never actually was signed to, thus had no releases on it. Who would’ve ever thought when you’re first getting into music that the more you end up liking it the more you’ll need to take a correspondence course to be a detective to clear up some of these matters? 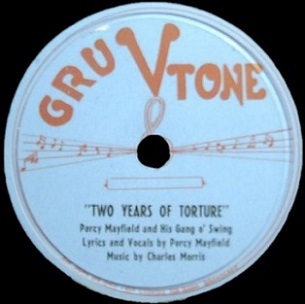 But enough about all that, what we’re here for is THIS record – the Gru-V-Tone issued one by Percy Mayfield that all of about eight people might’ve bought at the time. The record has a haunting quality to it from the very start, as the piano lightly dances across the treble keys while the horns, mic’d low, drone in the distance like a foghorn across the quiet harbor during a snowstorm, almost muted in the night air. The aural shroud the record is cloaked in adds to the mystery as Mayfield’s voice wanders into the scene, bemoaning his fate after he lost his one true love. Though he doesn’t delve too deeply into the particulars, the picture your imagination paints based on what he does divulge, and the way the sparse music frames it all, is eerie and unsettling. It’s a voice almost from beyond the grave, not just in the hazy fidelity but also in his words that drip with remorse and a sense of smoldering agony as he sings about “syndicators and backbiters” who conspired to take his red-headed love away from him. A few lyric changes aside, the difference between this and its later incarnation is found entirely in the dark, almost ghostly mood it conjures up. This Two Years Of Torture is a black & white B-movie in the making. A Robert Mitchum or John Garfield vehicle where Mayfield’s character exists mostly within moody flashbacks, perpetually hidden in shadows, the forces of evil looming over everything with a chilling sense of foreboding. A film, or a record, built almost entirely on atmosphere and in both cases it’s more than enough to keep you transfixed. It’s amazing to think he was a complete novice here, someone who had no real stylistic precedents yet had already settled on an approach that was utterly unique and totally captivating which would define his best work for decades. More than a mere storyteller in the typical songwriter approach, Mayfield was shaping up to be the Edgar Allen Poe of the music world, crafting songs that had layers of intrigue beneath the surface. It’s hard to pick out a specific moment to highlight, so gripping is the entire production, but as evidence of its allure pay particular attention to the instrumental break, with the piano thrumming along monotonously while a tenor sax moans in haunting dismay, as it’s interrupted by Mayfield’s seemingly ad-libbed asides barely on mic, which add even more texture to the entire proceedings. When the drums make their presence known ever so briefly coming out of the break, startling you back into consciousness before they too fade away, you’re left with a weary Mayfield, resigned to his ultimate fate, fully aware he is doomed but determined to stay on his feet until the grim reaper claims his soul. I don’t expect this could’ve ever been a hit record, no matter how big a label put it out, at least with this type of desperately stark arrangement, but more than most hits you can find this is enthralling in every sense of the word and worth all the investigative digging to uncover and bring it back out of the cemetery of long-discarded and forgotten records where it had rested for so long. Leave a reply on "Percy Mayfield: “Two Years Of Torture” (version one)"